In fine art painting, the term "Macchiaioli" describes a group of radical Italian painters who were active in Florence mainly from 1855 to 1865. Their name, which means "patches" is a derivative of macchia (patch or spot), since the use of many small patches of colour was their basic building block of painting - ideal for capturing the dazzling luminosity of Italy - and which they applied in bright, pastel and dark colours. Associated with 19th century Realism as well as early Impressionism, leading members of the Macchiaioli group - many of whom met up at the Caffe Michelangelo in Florence to discuss art and politics - included Giovanni Fattori (18251908), Silvestro Lega (182695), Serafino da Tivoli (1826-92), Giuseppe Abbati (1836-68) and Telemaco Signorini (18351901). Their main supporter was the critic and art collector Diego Martelli (183996), who was also the group's theorist. The celebrated society portraitist Giovanni Boldini (1842-1931) as well as the landcape and urban scene painter Giuseppe de Nittis (1846-84) were among the artists who sympathized with the type of modern art produced by the Macchiaioli. Like other modern art movements in Italy - such as Futurism (c.1909-1914), Spazialismo (c.1945-52), Arte Nucleare (1952) and Arte Povera (c.1966-71), the Macchiaioli movement brought with it a political undertone. The members - several of whom had participated in the uprisings of 1848 and the ongoing Risorgimento struggle - sought to contribute through their artwork to the revival and unification of Italy by depicting the most natural, authentic and vivid facets of the country's life at that time. To point the way forward for their country's renaissance, they focused on Italian traditions and painted scenes of realistic rural life. At the same time, in a purely artistic aspect, they reacted against the old fashioned style of academic art, propagated by the Academy, concerning both subject matter and style. On the one hand, they avoided historical and literary subjects in the academic manner, which they felt had little to do with reality. Nonetheless there is a distinct literary component in the paintings done by these artists, as in Fattori's history painting, Battle of Magenta, which presents a thoroughly modern view of this event. On the other hand, they reacted against form, using patches of colour to provide contrasts in light, while not allowing forms to lose their substance and solidity. (They believed that areas of light and shadow were the key components of a work of art.) This technique, opposed to conventional draftsmanship and sfumato (shading), gives their paintings a fresher look with simpler construction, all reduced to simple colour contrasts: indeed, they were greatly inspired by the bold tonal structure adopted by Old Masters like Rembrandt, Caravaggio and Tintoretto. Although they excelled at landscape painting, which showed the influence of the Barbizon School, they also produced a quantity of portrait art, and genre painting as well as historical works, the latter being much fewer in number. The word "Macchiaioli" had a negative, derogatory connotation at first and was first coined in a hostile review (November 1862) of an exhibition of these painters' works in the journal Gazzetta del Popolo. The reaction to this and the application of an unflattering name to the movement is strikingly similiar to what other modern artists like the Impressionists would experience later. While they were not well received by the critics of the day and enjoyed little commercial success - many of them died in poverty - their art movement is now considered the most interesting one in 19th century Italian painting. Recent exhibitions of their work were held at the Chiostro del Bramante in Rome (Oct 2007 - Feb 2008), the Villa Bardini in Florence (March - June 2008) and the Terme Tamerici in Montecatini (Aug 2009  March 2010). Some critics consider works by the Macchiaioli to belong to the early history of Impressionism. While there are a few similarities - the Italians were enthusiastic exponents of plein-air painting in order to better capture natural light, shade, and colour - important differences remain. For instance, they tended to make plein-air sketches instead of finished paintings, and they were far less rigorous than the Impressionist painters in their pursuit of transient optical effects. Furthermore, there is a strong literary element in their work, and no matter how bright their lighting effects, they never lost a sense of solidity of form. Naples-born painter noted for his bold, sometimes garish, colour palette. Cloister (1861) Galleria d'Arte Moderna, Florence. A drawing master, he produced landscapes from nature and some portraiture. La Rotonda di Palmieri (1866) Florence, Galleria d'Arte Moderna. Realist known for his Impressionist effects and plein air studies. The Lyric (1867) Palazzo Pitti, Florence. 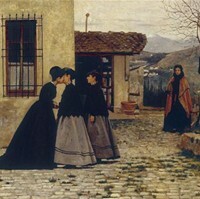 The Visit (1868) Galleria Nazionale d'Arte Moderna, Rome. One of the group's principal theorists along with Diego Martelli. Street in Settignano (1879) Meotti Collection, Milan. Leith (1881) Florence, Galleria d'Arte Moderna.  For the meaning of important pictures, see: Famous Paintings Analyzed.  Formore about 19th century Italian art, see: Homepage.